Customer service can make or break a company. So it’s surprising to learn that Mercedes-Benz – one of the most highly respected car manufacturers in the world – used to have a reputation for dismal customer service. 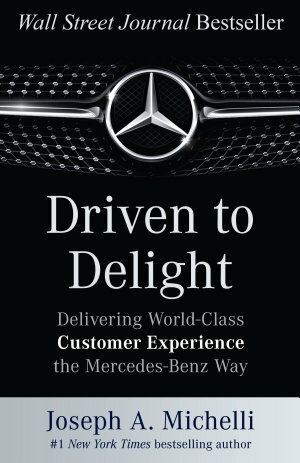 In the book Driven to Delight: Delivering World-Class Customer Experience the Mercedes-Benz Way, New York Times’ bestselling author Joseph Michelli examines the changes made at the top to rescue the company from itself. Joseph Michelli: I guarantee you that someone listening to (or reading) this interview right now is remembering how awful it was to be in the service line at Mercedes-Benz. Knowledge@Wharton: That’s strange because Mercedes-Benz is known for its quality cars, so you wouldn’t assume that this had been an issue. Explain how this all came about for Mercedes-Benz. Michelli: Our greatest strength is our greatest weakness. Their greatest strength was innovation and engineering. Their product was amazing. Sometimes you fall in love with your product and it becomes challenging to shift the working culture to stay in step with the times. But today, a good product isn’t enough. Knowledge@Wharton: What kind of approach did they take? Did they emphasize their technology and assume that the technology alone would keep people coming back? Michelli: That was the core challenge they faced. Of course, some dealerships were phenomenal — I don’t want to cast this with a broad brush. But the focus was the product. At one point in the company’s history, I interviewed customers who kept saying things like, “I should feel grateful that I got this car.” That was the perception that they had, based on the way they were treated at time of sale, and more importantly, in the service drive after they purchased the vehicle. Knowledge@Wharton: Mercedes is unique in the auto industry because they really haven’t had any large mechanical issues in the last couple of years, correct? Michelli: Relatively speaking, I think that’s true. They came out of the Chrysler merger with some morale issues and quality issues, but that was a long time ago. They had to get their staff re-engaged and motivated at the corporate level after that, so they focused on employee engagement at the corporate level and frequently got on Fortune’s list of best places to work. Beyond that, the corporate leadership had to re-engage people around the brand and change the conversation so that they weren’t only talked about for their engineering or marketing, but for the incredible experiences customers could have in dealerships. Knowledge@Wharton: This was a philosophical change that came right from the top. Stephen Cannon, the president and CEO of Mercedes-Benz USA, was the guy who really started to drive this change, correct? Michelli: Absolutely, and it really was visionary. The executives had meetings to discuss key opportunities and this was it. The Lexus brand was created from the best-of-the-best Toyota dealers. They had a customer manifesto when they came onto the scene. Lexus had a fresh approach to customer orientation that challenged Mercedes dealers who had been putting cars on the market for generations. I think Stephen Cannon wanted to bring the brand up to speed and decided that it wasn’t good enough to simply out-Lexus Lexus in terms of the customer experience. He really needed Mercedes to be the best for customer service, as per the brand promise. Knowledge@Wharton: What Mercedes-Benz is dealing with now is obviously different than what they were dealing with 40 years ago in terms of competition in the U.S. market. There weren’t as many high-end options for consumers. So in some respects, competitors like Lexus forced this change. Michelli: It’s a common theme in business right now. A recent Forrester study says 92% of companies say customer experience is a top strategic priority. They are trying to differentiate their business based on customer experience. Yet the American Customer Satisfaction Index shows customer satisfaction is at a nine-year low. It’s not the products. It is a proliferation of competitors who have access to comparable products, so the differentiation comes in the execution of customer experience. Knowledge@Wharton: Through your book and its exploration of the Mercedes-Benz story, you’re also opening the door for other corporate leaders to think about their customer experience, correct? Michelli: Yes. I’ve been blessed to be a consultant in this space. In fact, I came to Mercedes-Benz to help them benchmark their business against Ritz-Carlton and Zappos, which are other brands I’ve written about and worked with. For me, it is all about helping every single person improve the quality of experiences they provide to consumers because we all rise with better experiences. This means less stress. We don’t have to work so hard to get our needs met, and we have technology integration. Knowledge@Wharton: How did the poor customer service at dealerships affect the bottom line? Michelli: It’s important to note that the lifetime value of a customer is linked to their willingness to maintain a service relationship with the brand, which increases the probability that they’ll want to buy another car with the brand again. This ensures customers aren’t lured in by a competitor. Things suffered on the service side because people asked themselves, “Do I get it serviced at a Mercedes-Benz dealership or do I go outside of the dealership family?” The company was having significant churn and attrition in that space because service at the Mercedes-Benz dealerships was not up to standard. Knowledge@Wharton: Also, when you look at customer experience, you’re not simply competing against other automakers, as you alluded to before. You’re also competing against Ritz-Carlton and other top brands as well. Michelli: Yes. For example, Tesla’s creation of their customer experience, which has a more retail type of sales environment, is much more comparable to Apple than the traditional car dealership experience. Of course, Tesla has a much lower sales volume, so it’s not a fair comparison with Mercedes-Benz. But it demonstrates the disruptive force that exists in how things are changing in the industry. For example, people are buying more of their vehicles online and are just going into the dealership to sign the deal and to test-drive the vehicle. Most of these purchasing decisions now happen much earlier in the process, thanks to technology. This change in purchasing habits has to change the way you think about the customer experience. For example, I don’t need to go to a cashier at Apple to check out. I can do it right by the products, or in advance. There are many technology advances that are changing the way things are done. Unfortunately, for a long time in the service drive at Mercedes-Benz, customers still had to go from the service advisor to the cashier to pay. But that’s all changing with the integration of technology and a re-thinking of how the system works. Knowledge@Wharton: Does Mercedes-Benz have data to demonstrate how changes at the dealerships’ service departments affected the bottom line? Michelli: Absolutely, both in terms of repeat business and the willingness to stay with the brand. There’s no doubt that profits are associated with that. I read a report saying that if you use a tablet to sell a car, you normally get about $500 more for each car sale because there are car features that you can’t appreciate unless somebody shows them to you from a technological perspective. By investing money in the tablet, you derive repeated benefit. Knowledge@Wharton: You previously wrote about Starbucks. Are there similarities between Starbucks and Mercedes-Benz in terms of customer service successes? Michelli: Yes. I always preach the same thing: You need to know how you want your customers to feel about your brand, and they can’t feel everything. You have to define that emotional outcome. At Starbucks, it’s all about uplifting moments. The company wants customers to have an uplifting moment in their day and so employees are trained to be create uplifting moments. At Mercedes-Benz, they’re trying to delight customers. They want you to leave talking about how you were delighted. They want you tweeting about it and sharing it with your friends. In both instances, this goes above and beyond mere customer satisfaction. Knowledge@Wharton: In your book, you mention one gentleman who talked about his experience at the dealership and sitting in the new car. He basically said, “If I didn’t want to buy the car, I never should have sat in the car in the first place.” Some dealerships and some automakers just have that type of product, where customers have to get in the car to see it’s the right choice. Michelli: Absolutely. In retail right now, if you can get customers to stay in your store longer, they tend to spend more. This has led retail stores to offer items like coffee, tea and hot chocolate to try to get people to spend more time in the store, giving them more sensory connections to the experience of the store. The same is true with a car. Once you sit in it, feel the leather and smell the new car smell, you’re halfway there. Knowledge@Wharton: The Mercedes-Benz brand is among the best in the world. So the last thing that the company would want is to tarnish the brand with poor customer service when people get their cars serviced. Michelli: Yes. I’ve written about Ritz-Carlton in the past too. In some cases, I think there’s a point when employees can develop a certain arrogance around the brand. They think that they have created amazing brand equity because of their quality product, but then they forget that the product can be tarnished by a poor customer experience. If anything, a great experience can lift a product up. Knowledge@Wharton: Take us through some of the key things that the Mercedes-Benz management realized they needed to change. Michelli: Mercedes doesn’t control those private dealers. So they had to influence those dealers and get them onboard with a new vision for customer experience. To do that, they had to ensure it wasn’t going to cost a lot more to deliver the experience. They spent a lot of time looking for cost offsets. They found that if you owned a Mercedes-Benz, you were guaranteed lifetime roadside assistance, regardless of whether you bought it at a dealership or from a friend, and regardless of your service arrangements. Management decided to change the roadside assistance policy to ensure they were only serving customers who were engaged with the brand, which helped them save money for other parts of the customer service experience. Once money was freed up, the company started to see the derivative benefit of engaging customers. And then the profits started to align for those dealers too. Knowledge@Wharton: How much did changing the service element also affect the sales element? The two go hand-in-hand, but in many cases they are two totally different worlds. Michelli: You have to link them up. They may seem like different worlds in the minds of department workers within the dealerships. But as far as customers are concerned, a Mercedes-Benz is a Mercedes-Benz, regardless of whether you’re buying the car or getting it serviced. I’ve seen smart dealerships that make incentives for salespeople, telling them they won’t get paid until they warmly hand off customers to the service department. There are strategies to make those links happen to ensure the customer journey is seamless. Knowledge@Wharton: Did notes from concerned or upset customers encourage the management team to make these changes? Michelli: Absolutely. If you listen to your customers, they’ll tell you whether or not your experience is resonating with them. Clearly, there’s going to be breakdowns, but great organizations leverage a breakdown, fix it for that customer and find out whether there’s an underlying process that causes breakdowns to happen again and again. Then they fix those processes. Knowledge@Wharton: What did Stephen Cannon learn from this whole process? Michelli: I think he’s good at making hearts and minds follow his vision. He got people experiencing the brand in a rich way that they hadn’t experienced before. He’s been masterful at creating a strong culture. I think he thinks culture is the most important thing you can create to sustain your success. Knowledge@Wharton: How did this change dynamics at the board level for Mercedes-Benz USA? Michelli: They are so aligned on the board. It is a crazy aligned leadership team. Once you have agreement between the board of directors and the C-Suite, then you just need to keep centrically working it out throughout the organization to make sure the customer can feel the change too. Knowledge@Wharton: What do you see for Mercedes-Benz going forward? The U.S. auto market is such a dynamic place. In the last few years Mercedes-Benz has really tried to attract what would be considered the middle-class customer, as well. This marks a dynamic shift in how they approach sales, service and the whole nine yards. Michelli: Yes. They’ve done a masterful job. Mercedes has done a brilliant job with the CLA vehicle and other segment strategies. They are opening the brand up to aspirational buyers at a younger age and creating a new generation of life-long Mercedes customers. The future is bright for the auto industry. There are some incredibly exciting innovations happening right now. I think there will be more connections between the cars and the dealerships. Big data is going to allow a wonderful, customized experience for drivers. It’s going to be a lot easier to get your needs met in the future. I think we’re moving away from VIN numbers to a system where the customer is at the center, much like the Apple ID system, which centers all of your Apple products around you instead of linking you to an individual product. As a potential Mercedes customer who didn’t like the off-hand sales service, I can see why these changes were made. I originally went into a large Mercedes showroom to buy a new buy car after researching online, but the service was so poor I ended up buying a new Volvo instead! After just having spent $332 to replace a battery I still see some issues like gouging. Also I’ve called twice to see if a part that was ordered two weeks ago is in and I cannot even get a callback. Quickly losing faith in the Champaign IL dealership service dept. And, yes they still use the lines like “could’ve been worse” when you are astonished at the cost of simple repairs. I will consider never getting another Mercedes unless they clean up their act. For the first time in my life, I leased a car – a Mercedes, and that was a first too after being with Lexus for 20 years. MB service differs from location to location as I unfortunately found out when traveling. My E400 proved to be a lesson in the fact that while the MB is gold standard, but the technology in this car and the service from dealer to dealer is more like bronze. My local dealer is first rate and helped me with the dealer who was B rated when I was out of town. Right now I am not sure whether or not I will get a MB when this lease is up. But I will stay with the dealer who has 3 other brands they sell.